Earlier this year, Minnesota Connected boldly examined an important and controversial topic: Which term ought a proper Minnesotan use when referring to a carbonated soft drink? Readers were divided and Facebook debates ensued but, in the end, the hard data strongly indicated “pop” was the linguistic label most likely to be associated with sugary, fizzed-filled beverages served here in the North Star State. Now, two new studies from a researcher in the UK provide an interesting look into additional geographic quirks in the English language, while further illuminating the often unique verbal idiosyncrasies found in Minnesota. Aston University forensic linguist Dr. Jack Grieve and the folks over at Quartz have turned to Twitter to learn more about dialectal differences. First, billions and billions of Tweets from across the United States were gathered by University of South Carolina’s Diansheng Guo. They were then analyzed and algorithm-ed by Grieve, and eventually visualized into fancy colored maps on Quartz for mass consumption, well, via Twitter. ♦ “Buddy” is the most commonly used vocative among Minnesota’s Twitter users. ♦ “Pal” appears to be the second most commonly used, with a rather obvious higher concentration in Northern Minnesota. ♦ “Fella” somehow appears to be the third most common vocative here in MN, while “bro” and “dude” were thankfully found to be relatively uncommon by the study. 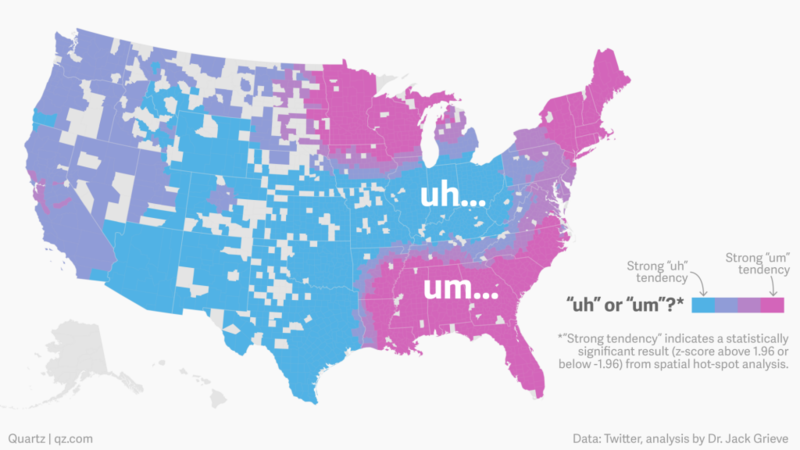 In a second massive Twitter-mining project with similar methodology, Grieve looked at the frequency of occurrence of two filler words—“um” and “uh”— on a county-by-county basis throughout the United States. As you can see from the graph, there are rather clear and distinct differences in how Americans use filler words depending on their, uh, geographic location. As you can also clearly gather from the data, Minnesotans, along with those aforementioned Mississipians who all just love to refer to people as “fella,” clearly live in an “um” state. Quartz’s article notes the study is based on Twitter entries and, thus, involves written, rather than spoken, language. However, as the article also points out, Twitter is a relatively casual medium and, therefore, conversational “linguistic quirks” are expected to show up pretty strongly in the data. Check out the full articles and cool data visualizations at Quartz for more detail, fellas.